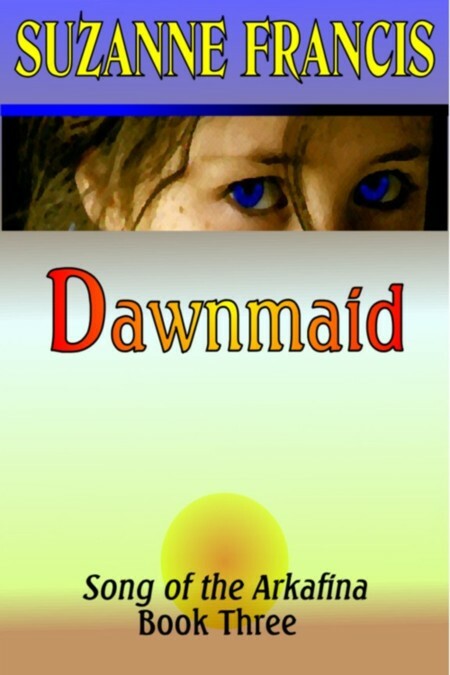 Based on some excellent feedback I have done a second cover for Dawnmaid. See which one you like better! The darker one looks better. Black and red is easier to balance than yellow and blue-ish. Looks “classier” too. I might be mistaken, but is that not a photo of the sunset? I notice that the color of the girl’s hair is different on the covers. What’s her actual hair color in the book? Oh and I like the large empty black area. Yes, it unbalances the design, but it also draws attention to the cover. I’m a sucker for black and red myself, so I do like the new one better. 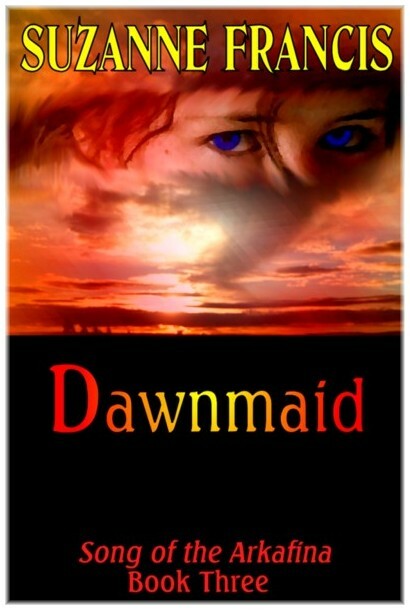 However, I will point out that a person on the cover is considerably different from the first two books in the series. I like the sculpture feel on the others, and this one is lacking that element. Other than the title of the series, there’s nothing that immediately ties this as book 3 to the others. I like the one on the left but the fade effect on “Dawnmaid” looks a little cheesy. Maybe just a straight color or some other effect would be better. The character’s hair in the book is black, but I was hoping I could get away with the idea it was colored by the sunrise flame. Joely– I don’t mind if it isn’t quite in keeping with the other covers. I’d like it to be eye-catching overall, and since I am still learning the process of cover design, I feel it is a step forward in sophistication. For some reason sunrises seem to have more pink and lighter tones in them. I don’t know why that is. There’s also a subconscious aspect. Sunrises have a different feeling to them and I guess that’s what makes photographers treat them differently, making this subconscious difference creep into the photos themselves. Come to think of it… The refractive properties of air might be changed by air temperature. So that when sunlight hits warm air (evening) it’ll look different from when it hits cold air (morning). I’m not a physicist, but it sounds plausible. Suzanne, the black and red is striking and it’s obvious how the title and cover play together, so if you don’t want/need a continuity in cover with the series, then go for it! Her eyes are haunting almost creepy. Cool. I like the black and red one. Very eye-catching. I was at the Mushroom Books website the other day, and saw your name listed under authors. I bet that makes you feel good! Congratulations! Hope it keeps up.